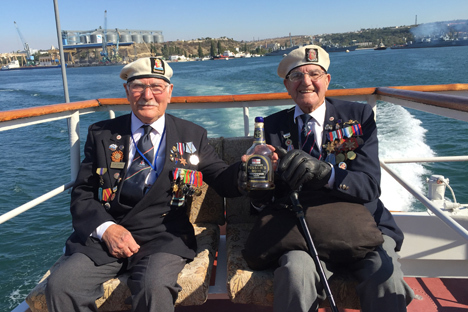 Arctic Convoy sailors visited Crimea in 2015. Ceremonies devoted to the 75th anniversary since the arrival of the Dervish Convoy in the Soviet port of Arkhangelsk will be held in Edinburgh on Aug. 30. The list of attendees includes about 40 British veterans who risked their lives to deliver military supplies, medicines and foodstuffs to the USSR as part of the Lend-Lease program. Besides the family members and relatives of the Arctic Convoys veterans, the ceremonies will also feature the participation of Scottish government officials, mayors of the region’s cities, servicemen of the Royal Navy, and Russian diplomats. The veterans will receive the Russian medals named after Admiral Fyodor Ushakov, which are awarded by presidential decree. Their honoring will continue with a gala parade from the Russian Consulate General to Her Majesty’s Yacht Britannia where they will receive a welcome from guards of honor and a Scottish brass band. After the parade, the Russian Consulate General will hold a gala reception aboard the yacht, which was once property of the royal family and is now a museum. The program of the official event includes performances by Russian and Scottish performing groups and a presentation of a unique photobook with historic pictures of participants in the Convoys and their recollections. "The reception aboard HMY Britannia and other actions as part of the celebration of the 75th anniversary since the arrival of the Dervish Convoy in Arkhangelsk is part and parcel of the many years of efforts of the Russian Consulate General in Edinburgh to commemorate these Convoys," Consul General Andrei Pritsepov said on the eve of the event. The Dervish Convoy, consisting of five British ships and a Dutch ship, left the port of Liverpool on Aug. 12, 1941, and arrived in Arkhangelsk safely on Aug. 31. It remained unnoticed by Nazi intelligence services. From 1941 through to 1945, British naval ships escorted 78 convoys of ships across Barents Sea to the Soviet ports of Murmansk and Arkhangelsk. The Convoys delivered 4 million tons of cargoes to the USSR, including more than 5,000 tanks and 7,000 warplanes.